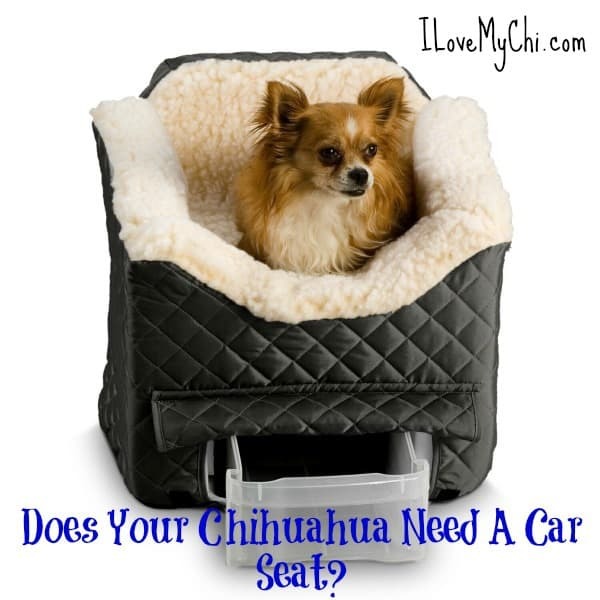 Does Your Chihuahua Need A Car Seat? 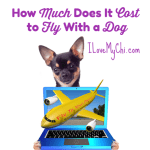 | I Love My Chi I Does Your Chihuahua Need A Car Seat? % Does Your Chihuahua Need A Car Seat? 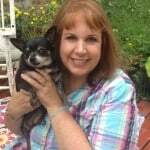 You are here: Home / Chi Products / Does Your Chihuahua Need A Car Seat? There’s nothing more thrilling than the call of the open road, and what better sidekick to ride by your side than your Chihuahua? Most of our little friends love tagging along with us, whether the destination is the park around the corner or a family reunion across the country. Since we want nothing but the best for our pint-sized pals, it’s absolutely essential to take canine car safety into consideration from the moment we turn the key in the ignition. Because Chihuahuas are some of the smallest dogs around, many owners think about purchasing a car seat to give their dogs some added height during a drive. 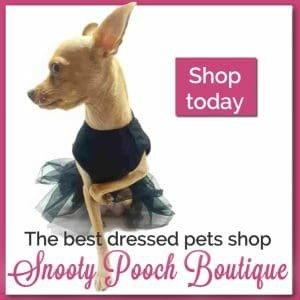 Those legs are short, and it can definitely be tough for Chihuahuas to see what’s going on around them during a car ride; we’re often tempted to let them cuddle on our laps while we drive, just so they can peek out the window! Car seats for dogs are becoming a more popular option for safe traveling with our furry family members, but they can have a few downfalls too. 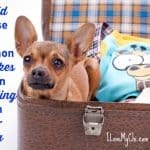 Here are some pros and cons for you to think about before picking out a car seat for your Chihuahua. • The right car seat can definitely make the ride safer – for both of you! Dogs have the potential to be enormous distractions in the car, so a seat that keeps your pup in one spot reduces the risk of an accident. • Although we never expect the worst to happen when we’re on the road, life can be unpredictable. A loose dog can easily become a dangerous projectile in an accident, or they can even be seriously injured themselves when we stop too fast! A tethered car seat with a harness can protect your pup from harm. 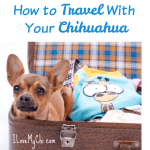 • Sometimes our Chi’s can be ‘Nervous Nellies’ when they’re traveling; raising them up so that they can see what’s going on around them may help to them feel more secure. • Aside from being a cushy spot for your pup to rest, a car seat can also protect your car upholstery from dog hair or the occasional piddle accident too. 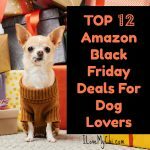 • You might need to try out a few different seats to find a good fit for your pup. Some seat restraints only attach to your pup’s collar (a huge no-no! ), or have harnesses that are flimsy or don’t fit well, making the seat less effective for protecting your furry friend. • Using a car seat in the front seat of your car could expose your Chihuahua to greater danger from the front airbags. It’s always best for your dog to ride in the backseat! • Because of the variety in car seat styles and restraints, it’s possible that your Chi might not be as safe in a seat as they would be with a crash-tested canine seat belt system or a secured dog crate. Whether you decide that a car seat is the way for your Chihuahua to ride in style, or another option works best for the both of you, make sure that your friend is always secure, no matter how long the drive may be. Buckle up, pups! i have used this type of car seat for Al my chi’s for two evades. I’ve never had. Problem with the Utah ow I could use new ones since the foam is breaking down. I’ve been using electrician tape to keep them sturdy.now to find them on the Internet. #MyLittle_ChaCha loves her car seat too! That’s great Deb. Many of them do love it because it helps them to be able to see out of the windows. Your ChaCha is a beauty! The car seat pictured above is known as a “Snoozer,” and sells for $39/95-$49.95. It is held to the seat by a seat belt. 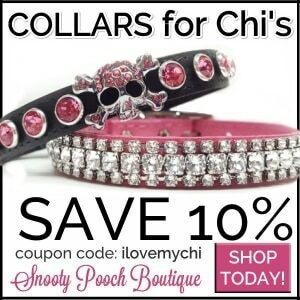 I used one with my 10 lb Chi “Elmo,” who was with us for 16.5 years. If I was alone with him in the car I secured the “Snoozer” to the front passenger seat and tethered his harness to a leash I attached to the headrest (slip not around one headrest post/wrapped around to provide only enough length to reach his harness. Elmo could sit up and see thru the windshield and side window or lay down with his chin resting in the cutout in front). An “Outward Hound” stroller was another good accessory to keep him from underfoot on boardwalks and at street fairs. Thanks for the info Charles. Here’s a pic of the Snoozer car seat in use.